Democratic presidential candidate Beto O’Rourke said during a campaign swing through Las Vegas this weekend that if elected he would not look to fund or reopen the shuttered nuclear waste repository at Yucca Mountain, a rebuke of efforts by the Trump Administration to kickstart the mothballed facility over the last two years. O’Rourke, a former Texas congressman, made the comment during an interview sandwiched between two campaign events late Sunday morning. In between bites of a bagel and lox, O’Rourke told The Nevada Independent he was “really disappointed” in a move by the Trump Administration to transfer plutonium to the state late last year without first notifying representatives. “I think beyond the concern in this state, I’m concerned about the other states and communities through which this waste will pass if it is transported here in the future,” he said. But O’Rourke did not provide a clear answer when pressed on where that waste should go if not to Nevada, saying he was “confident in a country this size” that there would be a place that fits the bill. “We should find a way to store that waste that provides the absolute minimum impact or risk to people, first and foremost, to the environment and to communities in this country,” O’Rourke said. The Texas Democrat also said he would look to reverse Trump Administration rollbacks of national monument designations, many of which were used as a tool by the Obama Administration to block the development of land by oil, gas or mining companies — including two national monuments in Nevada, Gold Butte and Basin and Range. O’Rourke said that the use of forests, in addition to other policies meant to reduce emissions like cap and trade or a carbon tax — could help capture some of the CO2 already present in the atmosphere. The former congressman’s visit began bright and early Sunday morning at a North Las Vegas taqueria, not far from Nellis Air Force Base. More than one-hundred people were packed shoulder-to-shoulder inside the small restaurant, with dozens more waiting outside. And while he took some firm stances — like a path to citizenship for DREAMers and a commitment to rejoining the Paris Climate Accords — his views on other policy matters were more general. His afternoon stump speech included mention of a proposal called “Medicare for America.” Sponsored by Democrats Rep. Rosa DeLauro of Connecticut and Rep. Jan Schakowsky of Illinois, the plan would seek to preserve the private health insurance system while also allowing Americans without health insurance to enroll in Medicare. He once backed the idea of a Medicare-for-all system, even describing in 2017 a four-step pathway to the system. Yet, at his campaign kickoff in Iowa he shied away from using the Medicare-for-all label. His vagueness on policy prescriptions has drawn some criticism of O’Rourke as he looks to scale his 2018 senate campaign — which, though he lost, far outperformed expectations in deeply-Republican Texas — nationwide. Critics, especially those to his left, have also charged the former congressman with being too centrist or moderate. During an afternoon swing by a coffee shop, O’Rourke stuck close to the same stump speech he gave hours earlier, again calling for the government to address immigration issues, climate change and health care. A former three-term congressman from El Paso, O’Rourke rose to prominence among national Democrats following his bid to unseat Texas Sen. Ted Cruz in the 2018 midterms. 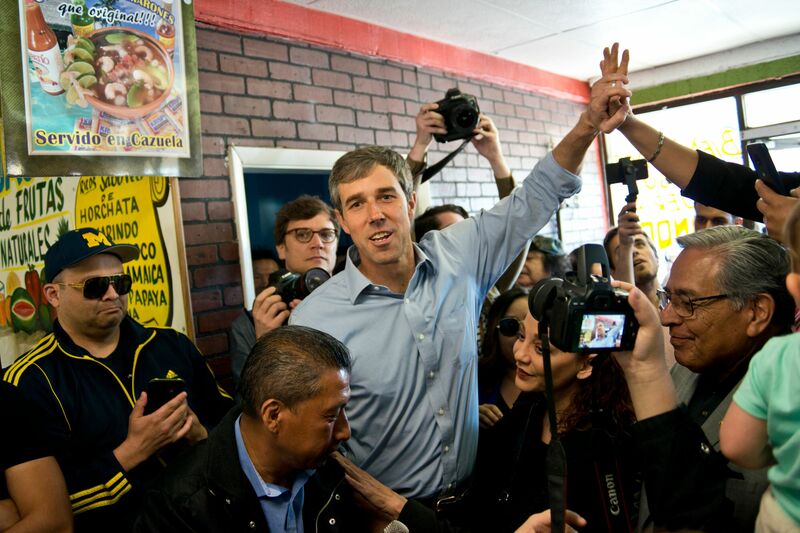 In a contest that garnered more than $125 million in contributions — the most expensive race in the nation that cycle — the underdog O’Rourke became a media darling on his way to a narrow (50.9 to 48.3 percent) loss in ruby-red Texas. Speculation of a presidential run followed closely behind, and though he got in the race late compared to other major candidates, O’Rourke’s campaign found an early fundraising boon, raising $6.1 million in the first 24 hours after his announcement — more than any other Democrat so far. 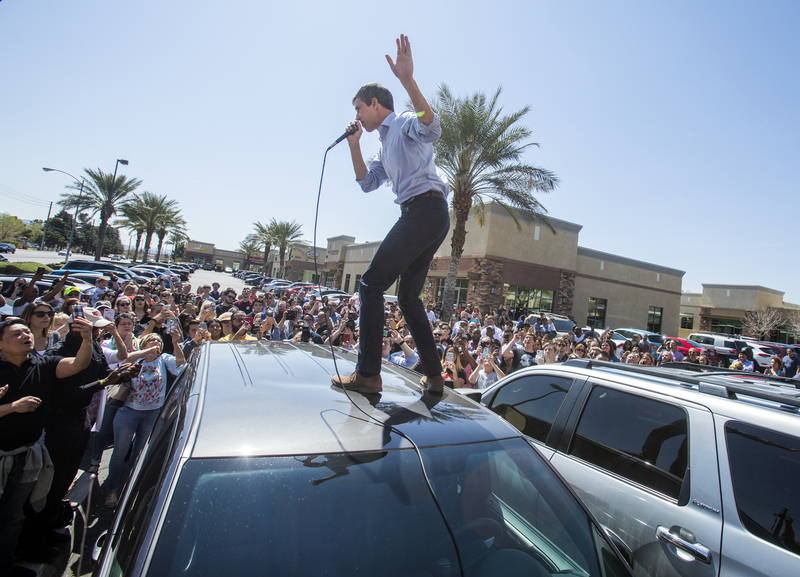 That was followed by a whirlwind tour of early primary states — six states in seven days — that looked to replicate the relative success of a Senate campaign that saw O’Rourke visit all 254 Texas counties and cover nearly 800 miles of rural, small town roads. Still, he remains outside the top echelon of candidates in early primary polls, trailing Vermont Sen. Bernie Sanders and former Vice President Joe Biden — who is widely expected to enter the Democratic race for president — by between 10 and 20 percentage points. However, early primary polls have a mixed history in predicting eventual winners, and no poll has yet been taken in Nevada. The former congressman also spent time meeting with political power players during his swing through Las Vegas, including a visit with the powerful Culinary Union and Rep. Steven Horsford. O’Rourke’s visit comes on the heels of campaign swings from nearly a dozen other presidential hopefuls in the last few weeks. That trend is set to continue into April, as President Donald Trump and Vice President Mike Pence are slated to speak to the Republican Jewish Coalition in Las Vegas the weekend of April 6.